A U.S. government official who was instrumental in founding the Federal Bureau of Investigation (FBI), and who served as its director from its official initiation in 1935 until his death in 1972. 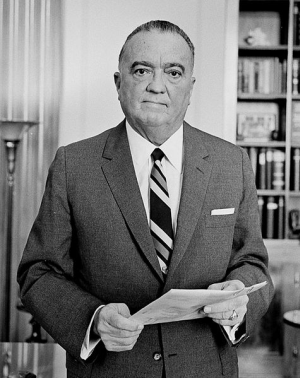 Hoover is known for developing the FBI into a powerful agency of federal law enforcement. However, he was and still is a controversial figure, as there is significant evidence showing that he secretly abused his authority by using illegal methods of surveillance, collecting evidence, and intimidating or harassing criminals as well as non-violent political activists. According to some critics, Hoover was able to maintain his position as director of the FBI for so many years by keeping secret personnel files on political leaders that he used as blackmail whenever the his tenure as director of the FBI was threatened. "J. Edgar Hoover, head of the U.S. Federal Bureau of Investigation, 1961" by Marion S. Trikosko is licensed under Public Domain. 2009 J. Edgar Hoover. http://www.webcitation.org/5kwrg7R6c, accessed April 9, 2015.